Maseru – Hard on the heels of complaints by the Lesotho Revenue Authority that illicit tobacco was depleting it revenue, the Tobacco Institute of South Africa this week again urged the SA Revenue Service to up the fight against the illicit tobacco trade, saying 55% of the tax body’s recently-announced shortfall could have been redeemed if it had stronger interventions against unlawful trade in cigarettes. Lesotho has also seen a serious erosion of potential revenue through smuggling of illicit cigarettes. Lesotho’s tobacco industry last year lost M100 million in revenue owing to increased smuggling of cheap cigarettes that are sold at ridiculously low prices to cash-strapped consumers. The besieged industry anticipates to haemorrhage even more profits this year, adding the national fiscus would also lose income as the underground traders obviously duck taxes. British American Tobacco (BAT) last week noted with concern Lesotho’s plans to slap a 30 percent levy on tobacco products which the conglomerate said will ultimately put a final nail to the coffin of the tobacco sector in Lesotho. The global cigarette and tobacco manufacturing company argues that the levy will increase the price gap between legal and bootleg to 82 percent, fuelling the growth of illegal traders’ share of the market to almost half by year-end. Kyle Fourie, BAT General Manager said cigarette smugglers are already cashing in on the huge price gap between legal products that pay taxes and their “ultra-cheap” cigarettes that are traded underground and are therefore not taxed. According to Fourie, this huge price gap is making struggling consumers think twice about buying legal products, and they are switching to illicit cigarettes in growing numbers. Illicit cigarettes are sold without payment of the relevant taxes thereby depriving the government of significant revenue streams. BAT estimates that it cost the legal industry M103 million in 2018 and that will grow to a further loss of M134 million in 2019 even without the 30 percent tobacco levy. “As legal traders we first pay the minimum tax of M19.16 per pack of 20, before we pay for production, transport and other costs, while they do not pay the taxes they are supposed to. It means they can sell a pack for as little as M10 while our cheapest product goes for M30 per pack,” said Fourie. BAT showed that with the limited capacity of the Lesotho Revenue Authority (LRA) and the country’s porous borders, there is no reason to believe smugglers will pay the levy, when they are already avoiding to pay their taxes. The company therefore shows that that puts all the jobs in the legal industry at risk and will cut government tax revenue, which is already short by at least M91 million a year in taxes not paid by illicit traders. BAT’s Legal and External Affairs Manager, Stephen Nyabadza told the press last week that the levy would bear bitter fruits even for the government of Lesotho. He emphasised that it would result in increased informal cross border trade which does not flow through the Lesotho revenue collection system. Nyabadza also highlighted that the 30 percent levy would also mean further reduction in government collection due to an increase in illicit trade. Every 1 percent reduction in cigarettes volume results in a M1.4 million loss in excise and VAT revenue for Lesotho. Nyabadza indicated that the levy would make cigarettes in Lesotho more expensive than in Eswatini and South Africa and that sustainability of the legitimate cigarette industry would be in danger due to acceleration of illicit trade. Last November, LRA said it had confiscated 380,000 illicit cigarettes worth just over a million Loti at the Maseru Bridge border post. This is the biggest single bust on illicit cigarettes in Lesotho in the past five years, tax authorities said. The contraband comprised predominantly the RG brand, which they say was classed as an illicit cigarette brand as it was sold below the legal M20 (or R20,02) threshold. RG is manufactured by Gold Leaf Tobacco, a company often accused of failing to pay taxes on their products. “RG is smuggled from here to Lesotho,” Van der Merwe Francois van der Merwe, a tobacco farmer and Tisa’s chairperson, told the media in November last year adding the 12,000 jobs in the traditional tobacco sector were threatened. Members of South Africa’s Food and Allied Workers Union marched to Sars’ offices last year to ask it to act against the illicit tobacco industry. Dumisani Sibeko, a shop steward at a Heidelberg factory, at that time said workers were hard hit. “There were retrenchments two months ago. Due to the decline of business, 50 workers lost their jobs. We used to produce 20 million sticks per annum, but we’re now sitting at 17 million sticks,” he said. However, Gold Leaf Tobacco, manufacturer of RG, said Sars had never had to act against their brand because it was above board. “Our RG brand is registered with Sars and there is nothing illicit about it,” said attorney Raees Saint. A report released in September by the Tobacco Institute of Southern Africa (Tisa) found that illicit tobacco companies are responsible for R7 billion per year in tax evasion and that Gold Leaf Tobacco is responsible for producing 75% of these tax-dodging cigarette brands. The report found that RG, selling locally for an average of just more than R10 per packet, is now the second largest brand in SA after Peter Stuyvesant. The LRA said their policy is to destroy cigarettes which are found to be counterfeit. “Much appreciated, we are working hard to control the illicit substances from entering the country,” was the response of the authority’s official Twitter account. 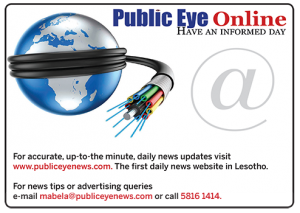 Lesotho has seen an explosion in smoking in the past decade – from 15 percent in 2004 to 54 percent in 2015 – thanks to aggressive marketing by tobacco companies and weak laws, according to health-e.org.za. A few years ago, Lesotho’s lone cigarette manufacturer trading under the Sun brand was forced to close shop, throwing dozens of workers into the unemployment pool. The company blamed smuggled tobacco sold at ridiculously low prices as having pushed them asunder. Leakages in the customs and excise system due to smuggling will stifle an already heavily depleted Lesotho Treasury whose boss Finance Minister Majoro was forced to announce serious belt-tightening, including not only a salary increase freeze for all civil servants but also an unprecedented 5 percent salary cut for all cabinet ministers. On Monday this week SARS announced a preliminary tax revenue shortfall of R14.6bn for the year ended March 2019. In a statement on Wednesday this week, the institute said by 2018 South Africa was losing more than R8 billion per year in evaded taxes due to the exponential growth in the sale of illegal cigarettes. 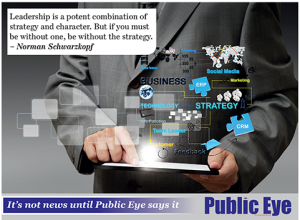 The institute’s chair, Francois van der Merwe, said the revenue shortfall highlights the tough job the agency’s incoming commissioner Edward Kieswetter will face. “The illegal cigarette trade in South Africa, which accounts for over R8bn in lost tax revenue this year, is one area where the new commissioner could make an almost immediate and significant difference to our country at this critical time,” he said. SARS acting commissioner, Mark Kingon, said earlier in the week that the agency’s illicit economy unit was focusing on “serious non-compliance” in the cigarette and tobacco industry. “Special efforts are also underway to further strengthen controls and improve compliance within the tobacco and cigarette industry,” he said. 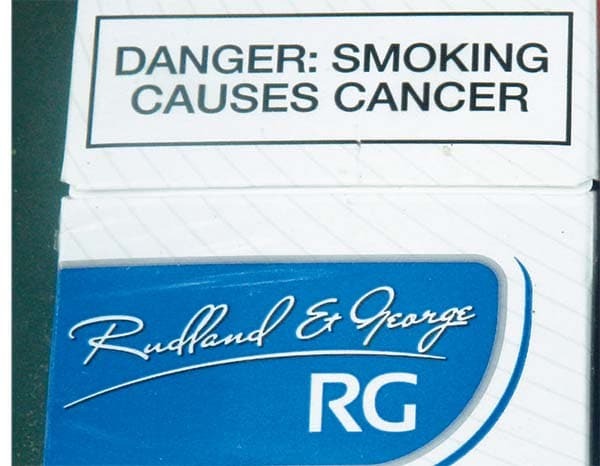 The institute said what it described as the biggest brand in South Africa – RG, made by the Gold Leaf Tobacco Corporation, was “selling for an average price of just R10 per pack”. “This selling price is merely just over half of the minimum collectible tax on each pack of 20 cigarettes,” the statement said. “All our brands are registered with SARS and all excise [taxes] are paid on our products,” the company told Fin24 in November.